Bacitracin, a kind of cyclic peptide antibiotic mainly produced by Bacillus, has wide ranges of applications. NADPH generation plays an important role in amino acid synthesis, which might influence precursor amino acid supply for bacitracin production. In this study, we want to improve bacitracin yield by enhancing intracellular precursor amino acids via strengthening NAPDH generation pathways in the bacitracin industrial production strain Bacillus licheniformis DW2. Based on our results, strengthening of NADPH pathway genes (zwf, gnd, ppnk, pntAB, and udhA) could all improve bacitracin yields in DW2, and the glucose-6-phosphate dehydrogenase Zwf overexpression strain DW2::Zwf displayed the best performance, the yield of which (886.43 U/mL) was increased by 12.43% compared to DW2 (788.40 U/mL). Then, the zwf transcriptional level and Zwf activity of DW2::Zwf were increased by 12.24-fold and 1.57-fold; NADPH and NADPH/NADH were enhanced by 61.24% and 90.63%, compared with those of DW2, respectively. Moreover, the concentrations of intracellular precursor amino acids (isoleucine, leucine, cysteine, ornithine, lysine, glutamic acid) were all enhanced obviously for bacitracin production in DW2::Zwf. Collectively, this research constructed a promising B. licheniformis strain for industrial production of bacitracin, more importantly, which revealed that strengthening of NADPH generation is an efficient strategy to improve precursor amino acid supplies for bacitracin production. The online version of this article ( https://doi.org/10.1007/s12010-018-2894-0) contains supplementary material, which is available to authorized users. D Cai and S Chen designed the study. S Zhu, D Cai, and Z Liu carried out the molecular biology studies and construction of engineering strains. S Zhu, Z Liu, B Zhang, and J Li carried out the fermentation studies. S Zhu, D Cai, S Chen, and X Ma analyzed the data and wrote the manuscript. All authors read and approved the final manuscript. This work was supported by the Technical Innovation Special Fund of Hubei Province (2018ACA149) and the Science and Technology Program of Wuhan (20160201010086). Cai, D., Chen, Y., He, P., Wang, S., Mo, F., Li, X., Wang, Q., Nomura, C. T., Wen, Z., Ma, X., & Chen, S. (2018). 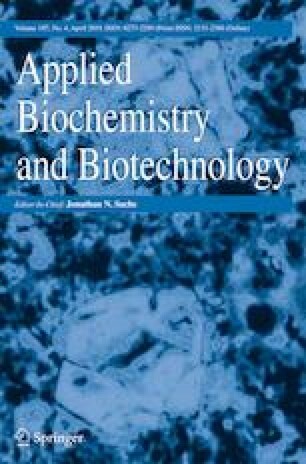 Enhanced production of poly-gamma-glutamic acid by improving ATP supply in metabolically engineered Bacillus licheniformis. Biotechnology and Bioengineering. https://doi.org/10.1002/bit.26774.